Fig. 1. The Congregationalist (4 July 1895). In 1893, Miss Bates had been called to join the faculty of a summer school at Colorado Springs. On the way she visited the Columbian World’s Fair at Chicago. The architectural vision embodied in the marvelous “White City” gave the inspiration for the last stanza as a forecast of what America might do in the achievement of ideal beauty. The end of the three-weeks’ session of the school was celebrated . . . with an excursion to the summit of Pike’s Peak. Miss Bates was so affected by the rarefied atmosphere at the summit that she, with two others, could remain for hardly more than “one ecstatic gaze.” But it was an historic moment. “It was then and there,” says the author, “as I was looking out over the sea-like expanse of fertile country spreading away so far under those ample skies, that the opening lines of the hymn floated into my mind.” . . . The four stanzas of the poem were penciled in the author’s notebook at Colorado Springs. But for nearly two years they lay there unheaded. Then they were sent to The Congregationalist, appropriately printed on July 4, 1895 [Fig. 1]. Bates reportedly revised the poem for the 19 Nov. 1904 edition of The Boston Evening Transcript, but a copy of this paper scanned by Google Books does not appear to contain this text. She revised it again for her collection America the Beautiful and Other Poems (NY: Thomas Y. Crowell Company, 1911: PDF); this is form has become the official version. Bates’ alterations between 1895 and 1911 were extensive and should be seen as improvements that have generally aged well. 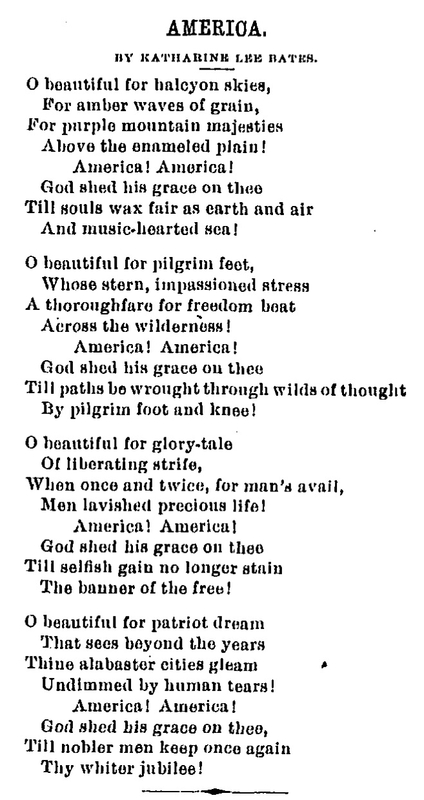 In some modern hymnals, the stanza about “stern, impassioned” pilgrim feet beating a path through the wilderness is omitted, as is it ignores the damage done to Native American culture, and it evokes other concerns related to colonialism and imperialism. Tune. Initially, the poem was set to music by many composers in various contexts. For example, the Library of Congress has digital copies of settings by William Fisher (1917), Joseph Fletcher (1918), R. Nathaniel Dett (1918), and William Glover (1919). When Bates’ poem first appeared in hymnals, it was set to a tune by Charles S. Brown, including in Junior Carols (1906 | Hymnary.org) and The Praise Book for Young Peoples' Societies (1906 | Hymnary.org). The tune that has become synonymous with Bates’ text is MATERNA by Samuel A. Ward (1848-1903). 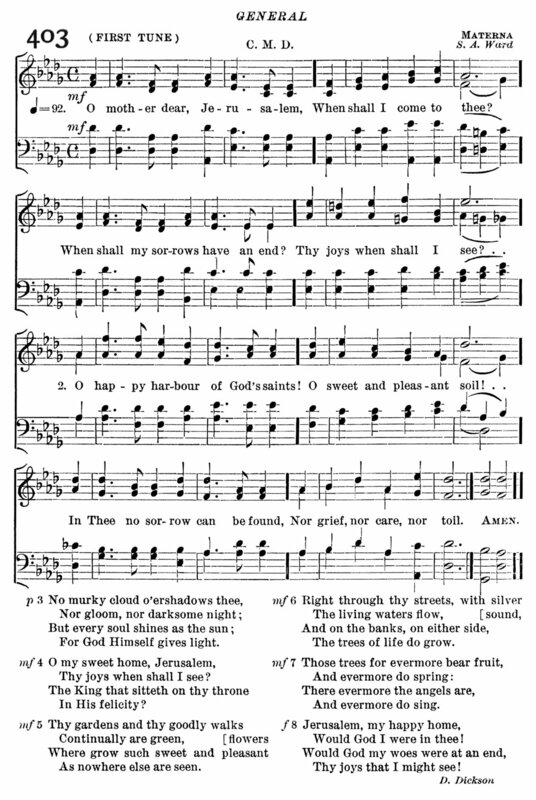 Ward’s tune was originally intended as a setting for the hymn “O mother, dear Jerusalem,” and it was first printed in The Parish Choir, vol. VIII, no. 378 (12 July 1888 | Fig. 2). The first appearance of MATERNA in a hymnal was in The Church Hymnal, edited by Charles Hutchins (Boston, 1894 | Fig. 3). By some accounts, the felicitous pairing of Bates’ text with Ward’s tune happened as early as 1910, but the first such pairing in a hymnal seems to have been in Hymns for Schools and Colleges (Boston: Ginn & Co., 1913 | Fig. 4). Fig. 2. The Parish Choir (12 July 1888). Fig. 3. The Church Hymnal (1894). Fig. 4. Hymns for Schools and Colleges (1913). Sylvester Baxter, “America the Beautiful,” Journal of Education, vol. 88, no. 16 (Boston, 31 Oct. 1918), pp. 428-429 (Google Books).